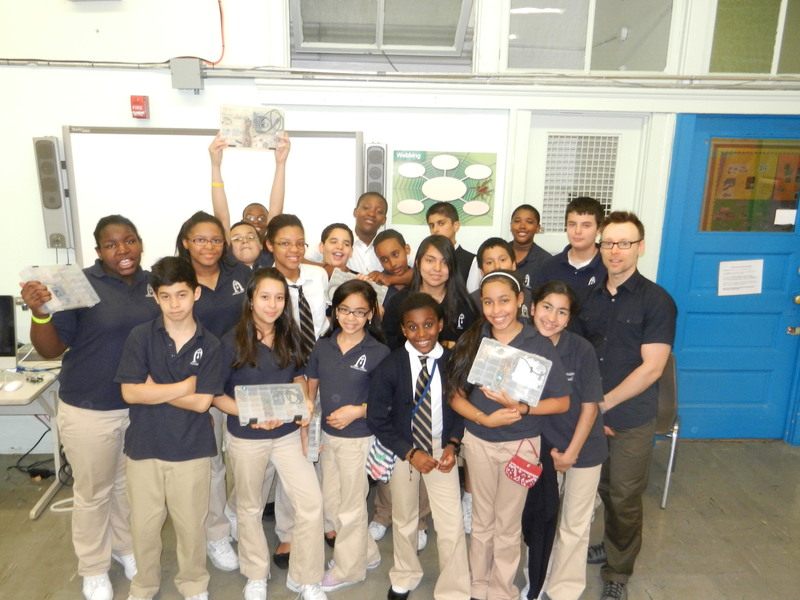 One of the most rewarding and equally challenging things I have accomplished was teaching a pilot class at Ascension School: Arduino for 6th graders. My goodness this takes a monumental amount of energy! Generally, I think the fear as educators, is that getting kids past the nature and syntax of C is asking too much. My experience was, it is not! I do not believe everything we present to kids has to look like it was made for kids. Funny how exciting the humble blink sketch is. This is not lost on kids! 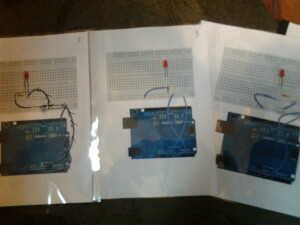 Word to educators however: Arduinos ship with the Blink sketch on them, for testing I imagine. So that can be anti-climactic if it’s already blinking when students plug in their boards. Better to upload a blank sketch, so kids experience that sense of accomplishment! I was very happy that one student who’d been generally having a hard time in school found something he was really good at. 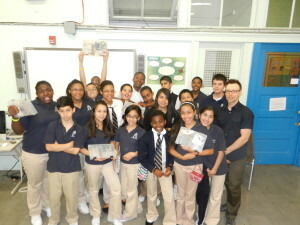 The school purchased 6 ArdX Experimenters Kits from Adafruit. I had the kids working in groups of 3 for the most part. I found that one stumbling block turned out to be understanding the inner workings of the breadboard. I ended up making some wiring diagrams with Fritzing and printing them out. This shows some of the printouts in transparent folders. I gave the kids dry-erase markers and their task was to trace the path of current through the circuit. From here I could get a feeling for who had it and who hadn’t gotten it yet. This entry was posted on Saturday, June 16th, 2012 at 3:35 pm	and is filed under Uncategorized. You can follow any responses to this entry through the RSS 2.0 feed. You can leave a response, or trackback from your own site.